To represent information about the earth's surface, whether on a paper map or with digital data, requires some agreed-upon system for associating features in the map or data with particular locations on the real earth. This involves two distinct issues: geodetic coordinate systems and map projections. For accurate results, it's necessary to know this information about any data you use. A geodetic coordinate system is a framework for assigning coordinates to specific locations on the earth's surface. The most familiar system is the latitude-longitude system, in which latitude from the equator is measured in degrees north or south (or -90 to +90), and longitude from a prime meridian is measured in degrees east or west (or -180 to +180). However, even such a simple system is not complete without some way of relating those measurements to the actual earth. The relationship between a latitude-longitude system and the earth is defined by a model for the earth's shape (a spheroid) and a tie-point connecting the coordinate system to the earth model; together, the spheroid and tie point make up a datum. There are many spheroids and datums in use, though much recent data (such as satellite and GPS data) is referenced to WGS84. 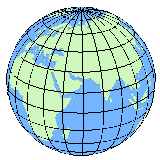 In order to display information from the curved earth on a flat map or screen, coordinates need to be projected from a latitude-longitude system to a rectangular system. There are a large number of map projections in use, and most of them can be adapted for different regions of the earth's surface. Un-projected data referenced by latitude and longitude, while technically not in a projection, are sometimes said to be in a "geodetic projection". In any case, to accurately locate a dataset, its specific datum and coordinate system or projection must be known.